A report out of Germany last week described how Syrian refugees, frustrated by that country’s bureaucracy, had launched an app to help them deal with the red tape. It’s called Bureaucrazy, an apt name for an app aimed at decoding the Kafkaesque processes that define bureaucracies. But Franz Kafka would have had fun with South Africa’s bureaucracy because judging from the letters I’ve received in the past few weeks, it’s time for a “metamorphosis” right here, before we lose more critical skills and valuable members of society. The complaints are alarming. 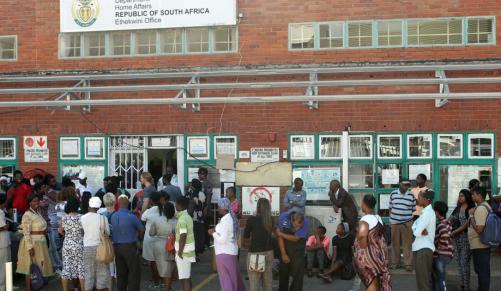 An “exceptionally skilled” foreign doctor working in a rural HIV/Aids treatment centre cannot get a work permit and has been classified as an “illegal foreigner”; a South African-born woman who cannot get permanent residence after relinquishing citizenship decades ago; a British-born woman who has spent most of her life here as a permanent resident but is now red-flagged; a British woman who has been here for two decades and has waited two years for permanent residency approval; a professional couple who can’t get any joy with their permanent residence application from South African authorities, so they’re trying their luck with New Zealand. Having attended a presentation titled “Trying to communicate with the government”, I realise where the focus lies – on trying. Because it’s not only frustrating, it’s nigh impossible. Officials screen their calls and complaints from the public don’t seem to be a priority. When they do finally respond, it is with a promise. And then nothing happens. Immigration specialists say this is par for the course. Julian Pokroy of Julian Pokroy Attorneys in Pretoria told me: “I have literally hundreds of examples in all categories of applications. “Communication with the Department of Home Affairs at any level has become particularly difficult, with only a few exceptions. “More than often telephones are not answered, e-mails are not responded to and precisely what you have experienced in trying to communicate at various levels within the Department of Home Affairs, and indeed also the ministry, are the rule rather than the exception. You are not alone! “With the advent of the new “immigration” regulations in 2014… we have seen a declining level of service delivery. “The intervention’ of VFS as an outside body functioning as a receiving and dispatch agent for the department has not only pushed up the cost of obtaining a visa because of the additional fee… but it has become a buffer which effectively shields’ the department from the client/applicant. Nicola van Rensburg, head of consulting at Immigration and Consulting SA in Cape Town, echoed the sentiment: “We share practically all the experiences you describe but there are also positive examples and stories to be told. “The general feeling in the industry is when engaging with Home Affairs, the instinctive approach is often to defend policy and the department’s view, rather than to look at the actual problems and find suitable solutions. “Obtaining meetings with (Home Affairs) is also very difficult, and even large corporates find where a meeting is eventually possible they have gained little from the effort and time taken to secure this. “We also experience poor quality of decision-making fairly frequently – unjustified rejections, errors in visas issued etc. “Positively, we are finding processing times are becoming quicker and, for certain categories, the outcomes more predictable. We would like, however, to see this happen across the board for all types of visas and permits, as well as appeals. For Craig Smith, principal attorney at Craig Smith & Associates in Cape Town, the system’s inefficiency is particularly grating because it prevents professionals with critical skills from working in this country. “It is a constant battle with the medical doctors and health professions in general… they have the very critical skills that our country should be attracting. “When Home Affairs changed the law on May 26, 2014, it made matters considerably worse for foreign doctors. Why? For a host of reasons. “Our Department of Home Affairs has opted to contract Cuban doctors under treaty agreements between the two counties to fill vacant posts for doctors. “It then keeps these Cuban doctors to ransom by not allowing them to apply for permanent residence as the terms of their work assignment. The doctors don’t want to return and thus stay for years and earn considerably less than the going rate. “For example, I have Cuban doctors who have been in SA for over 10 years on multiple renewed temporary residence permits and when they want permanent residence they are disallowed,” he said. “The other problem is Home Affairs takes a very strict approach to the acceptance of waivers or endorsements by the Department of Health that would normally make it easier for foreign doctors to work in SA. (It) is also cognisant of government policy to keep out foreigners. “Home Affairs, through its Foreign Workforce Section in Pretoria, is also slow to endorse and canvass for foreign doctors, who are clearly highly skilled, as opposed to treaty arrangements with second-rate skills from Cuba. “Finally, the Health Professions Council of SA has failed foreign doctors who wish to relocate and work in South Africa. “They put them through the most frustrating administrative testing requirements to qualify as a professional practising independent doctor in SA. (The council is) slow to respond to the needs of foreign medical doctors and out of touch with the reality and recognition of what these foreign skills can bring. “In essence, all these factors results in an overall lethargy among the health professionals to fast-track their work rights and secure them into the future with residence. “I’am constantly litigating against Home Affairs and trying to challenge the constitutionality of various provisions. Van Rensburg is optimistic change is coming, in the form of the Green Paper on International Migration in South Africa, which was published on June 21. It is open for comment until the end of next month. Nothing’s likely to change soon though, which is why news of a Zimbabwean preacher’s direct appeal to Home Affairs Minister Malusi Gigaba on Twitter was encouraging. Gigaba responded within minutes, referring the preacher to a staff member who he evidently relies on. I, too, received a response from Chief Ntshingila, a man whose sign-off says: “It is always an honour to serve the flag.” That’s more like it. If only we had more such people in government. Home Affairs and the Health Professions Council of SA did not respond to numerous requests for comment. The DA did and suggested readers lodge complaints through their office. They cannot promise assistance, though. Try the DA: Mail assistance@da.org.za or visit www.da.org.za. Complaint forms and all supporting documentation, including receipts, copies of IDs/passports and other information are required. Seek help: If your application is not proceeding, contact a specialist. Immigration lawyers have contacts and better prospects of success than members of the public.